So, I have the idea and I have the location. I might even have the victim. I certainly don't have the killer or the plot. I put the idea, location and victim in a circle and I ask myself open questions: who, what, where, when, why, and how? I don't have all the answers, in fact I have very few so I do some research, and some more thinking, and gradually I begin to answer some of those questions. This begins to form a loose outline of a plot. I draw up a plot line, which is very sketchy to begin with and might only be the first three or four chapters. I've created some characters, aside that is from the usual cast of characters who appear in the Inspector Andy Horton crime novels and those who regularly appear in the Art Marvik crime series. Then I start the creative writing process as soon as I can and direct on to my computer. The first draft is the free flow creative writing stage when I'm eager to bring the idea and characters to life. I like to write this first draft as quickly as possible. The characters who are to appear for the first time in that novel (not my regulars) are initially hazy, they're not fully formed, but they start to come alive as they speak, move around the scenes and interact with others in the novels. The grammar and punctuation in this first draft leaves a lot to be desired but that is something that can be corrected later. As I write, more ideas come to me. I conduct further research. The plot begins to fill out and take shape and the sub plots are weaved in. 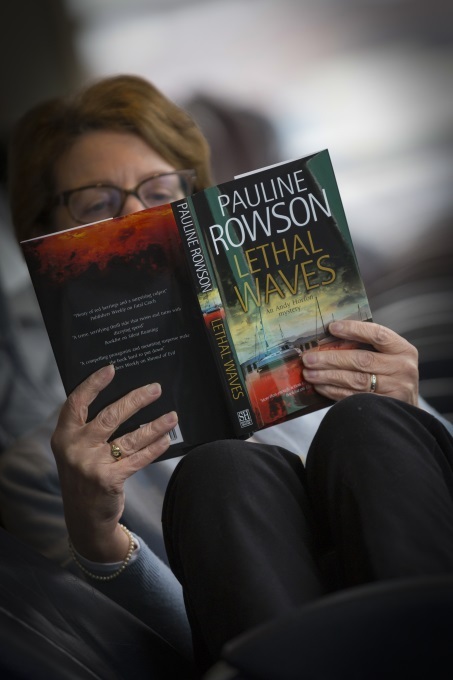 In the Andy Horton series there is also Horton's ongoing investigation to discover the truth behind his mother's disappearance thirty years ago. It's a tricky business keeping track of it all, which is where the plot lines, or storyboard, come in handy. I also keep a running check of what is happening in each chapter. I will keep a record of the chapter page numbers, the setting, who appears in each chapter and the action. In addition, on the left hand side of the page are the factual details, for example the times of sunset and sunrise; the times of the tides and whether it is high or low water, essential information as my novels are all set against the backdrop of the sea. As I write this first draft I will also flag up questions that at some point need to be answered, this might be connected with research or it might be why X has said something and gone somewhere, or why Y has done this or that. All these questions I keep a list of, knowing that as I work my way through the novel they will need to be answered. My aim is to get the first draft written as quickly as I can and not to get hooked on editing. The latter is very easy to do, because as most of us know editing is easier than creating. Many writers can spend an enormous amount of time making that first chapter, that first paragraph even that first sentence perfect, but striving for perfection during this phase means the rest of the novel never gets written. It usually takes me about three months to write the first draft. It's a pleasurable time but also a frustrating one because I am keen to get the story written. Once I have approximately eighty five thousand to a hundred thousand words on screen I can then breathe a sigh of relief and look forward to the second draft and many more revisions to come.